Dan (left) with fellow Summer Stroller Mike! attends as many EFEPA events as he can, is the Team Captain for the Philly Brainstormers Summer Stroll Team, and works hard to raise awareness about epilepsy. Plus, Dan has had epilepsy for almost his entire life. 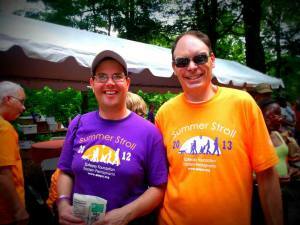 He has dedicated himself to helping others through education about epilepsy. Recently, the organization Health Central selected Dan to do a feature showing what life can be like for someone with Epilepsy. His amazing story is featured and showcases both the challenges someone with epilepsy can face and the ways he has been able to overcome them. Truly an inspiring story for any and all to watch. To watch Dan’s story, click the following link: Dan’s Story.